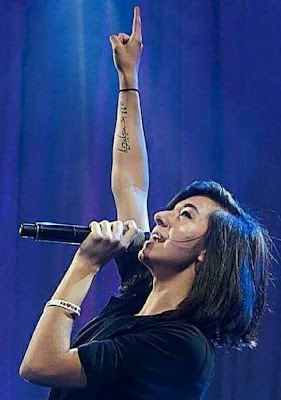 Never Give Up: Christina Grimmie's Prophetic Tattoo: "All is Vanity"
Christina Grimmie's Prophetic Tattoo: "All is Vanity"
Christina Grimmie got a tattoo on her forearm shortly before trying out for Season 6 of The Voice (where she would deliver her now legendary jaw-dropping, four-chair-turning "blind audition," which still frequently makes "top-ten-greatest-ever" lists for these music competition shows). It was the text of Ecclesiastes 2:1 written in English but using the "Elvish script" invented by J. R. R. Tolkien for his epic fantasy The Lord of the Rings. This combination exemplifies Christina's way of spontaneously integrating her whole life ("food, music, and video games, all raised up and united in Jesus," she once said). Her struggle to be in the world without being of the world had many facets. Surely there were times when going to Hollywood, into the heart of the big American music/entertainment industry, in order to share her immense talents while being true to her faith and her humanity must have seemed as daunting as Frodo's task of bringing the One Ring to Mordor to be destroyed in the fires of Mount Doom. But Christina Grimmie knew that life is a fight, in the sense that it engages us in a battle to build up and accomplish the good, and overcome obstacles that thwart goodness or try to destroy it (i.e. evil). This doesn't mean that life has to be grim all the time. On the contrary, life is a challenge, an adventure, a chance for heroism, a responsibility to give and receive love. Every person is unique, and exists for a reason—to fulfill a calling, to become fully the person that God created them to be. We know that life aims for greatness. Sometimes it can be very hard; other times it can be lots of fun. But in order for life to flourish, it needs to be focused. That's why Christina put the phrase "All is vanity" on her forearm. She explained it in terms of staying focused. She noted that it was a reminder to her to "keep God first" in her life. It was also to help her remember that she should never allow any kind of fame or success to make her puffed-up, egotistical, or self-absorbed. She didn't want her life to get "out of focus." She didn't want to be distracted by the vanity of merely temporary and superficial things that might make her forget her fundamental vocation to love God through Jesus, to love her family, her friends, and her frands, to give of herself through the gift of music. No doubt Christina was distracted plenty of times, just like we all are. Her faith (helped by the expression etched on her arm) would help her to put things back into perspective. It served her right to the end, and it still provides us with a chance—beyond our sorrows—to appreciate the enduring achievement of her life, and to stay focused in our own lives. The phrase "All is vanity" doesn't mean that life has no value or purpose. But what it means is that ultimately we can't keep anything. Life in this world is not meant to last. It's meant to be given away, to become love. Otherwise its promises fade, they disappoint us, or they get stolen from us. We're on a journey. It's a beautiful, joyful, magnificent journey, but it's also violent. This is because we have an enemy who wants to steal everything. This enemy has tremendous power—power to deceive us, to connive against us and cheat us, and to take and even destroy everything we have. "All is vanity." But the enemy can't keep us from giving it all away, from turning ourselves and all we have into a gift of love. Love can't be stolen, because it has already been given away. All this sounds too painful, overwhelming, inconceivable. How can we possibly love like this? How can we do this, give like this? But here is the good news: Someone has already come and has done it all. Everything belonged to Him. He gave it all away. He gave it to those who wanted to take it away from Him. He who is Love, came to be with us, to win the victory of love in our flesh, so that we could become gifts of love in Him. "All is vanity"... because its value is really (and only) to point us toward the Someone for whom we have been made. In Him we will find, forever, everyone and everything dear to us in this life, and more: we will find all the love we ache for. We journey through this life, with and through limited realities, toward an Infinite fulfillment. It hurts a lot, this life, because our souls are being stretched for the Infinite. The One who loves each and all of us never intended for bad stuff to happen in this world, but He lets it happen sometimes. He lets it happen because in order for us to love Him and one another, He had to make us free. We can't be forced to love, and that means we are free to turn away from Him, to become lost in the vanity of things-without-Him, and thus to bring forth violence against one another. He allows the abuse of freedom and its incalculable consequences and all the seemingly unbearable distress that this entails for life in this world. But He doesn't allow it to prevail in the end. He permits it only because He has a plan to turn it inside out and bring forth something good and beautiful beyond anything we can imagine. God is good, all the time. But it's hard to see it. We have to be made bigger, so He "stretches" us and it hurts terribly and we feel like we're going to break. He knows what He's doing, but it's hard sometimes and it takes time.